Colouring and drawing brings out the creative side in every child and here at Jumpin' Jacks Toys we have compiled a selection of kids colouring and drawing sets and supplies that will allow them to develop their artistic skills from a very early age. 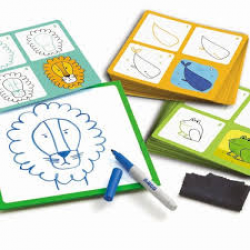 Drawing and colouring in is an essential activity for all kids, particularly for those who haven't developed their communication skills as it allows them to express what they are thinking or feeling. Drawing also draws on a child's memory recall ability and encourages concentration. It is an integral part of a child's development. Here you'll find a large range of crayons and pencils as well as felt tip pens. We've also got some wonderful stencils for kids featuring various themes, plus pencil cases, drawing and colouring activity books and a kids easel. Honeysticks beeswax crayons are made from New Zealand beeswax and non-toxic pigments so they are ..
An 8 Pack of thinner natural beeswax crayons that encourages correct finger/hand grasps for writing.. The Smarkers 6-Pack includes 6 of our gourmet scented markers made from recycled newspapers and pla.. Silk Crayons - a fun set of eight (8) vibrant colouring-in tools for kids.Silk Crayons will..
Easy to use for little hands and compact to pack away, the Tiger Tribe Stackable Markers are a fun ..